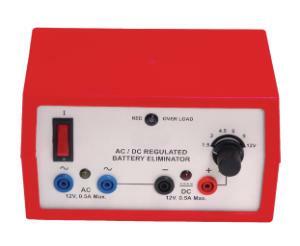 This economical power supply works with a variety of experiment needs. This unit provides two independent outputs: 12 VAC and 12 VDC regulated. The black knob on the right side of the front panel makes it easy to select the outputs, which are calibrated per the printed output voltage on the panel. The AC and DC voltage outputs can be used simultaneously. The power supply includes an overload protection indicator, glass fuses at the input level, and one spare fuse at the main input socket.